Elderberry for Respiratory Infections and Influenza A and B. "Inhibitory Activity of a Standardized Elderberry Liquid Extract Against Clinically-Relevant Human Respiratory Bacterial Pathogens and Influenza A and B Viruses." BMC Complement Altern Med. 2011 Feb 25;11:16. Krawitz, C., et al. Justus-Liebig-University, Giessen, Germany. The most common elderberries are Samubucus nigra. The berries are edible only when fully ripe, and other parts of the plant are not “recommended for human consumption”. Elderberries have been used as medicine since Hippocrates (400 BCE), and anthocyanins from elderberries are chemicals which provide many of the health benefits. Influenza virus infections cause seasonal flu of humans, which can become epidemic. Medications against influenza virus disease work temporarily, but the virus soon becomes resistant to medications. Bacterial infections frequently follow virus disease, so agents which work against both viral disease and bacterial infection would be useful. It is already known that elderberry liquid works against infections of the upper respiratory tract. The present study was to determine how well a German elderberry extract works against influenza types A and B. The anthocyanin concentration is 3.2%. When various bacteria, such as Haemophilus influenza, were grown in a culture with a strong concentration of elderberry extract, the bacteria numbers were reduced to 1% of their original numbers. However, Staphylococcus aureus (MRSA and MSSA) and Streptococcus mutans were not inhibited by elderberry. 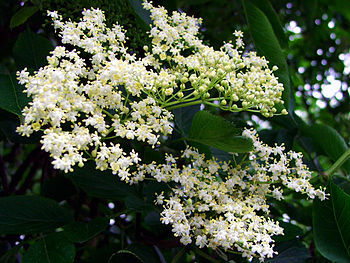 The elderberry extract was effective in two strains of influenza virus, types A and B. CONCLUSION: Rubini* elderberry extract is effective against bacteria and Influenza A and B viruses. It is also active against viruses during cold and flu season and against the bacterial infections which often accompany them. NOTE: *Rubini is a specific brand of pure elderberry extract. To see the author’s abstract of the article, click on the title of the article. Then, to read the full article, click on the free full text icon.